Book Club: Chant and be Happy! ~ The Toronto Hare Krishna Temple! Book Club: Chant and be Happy! 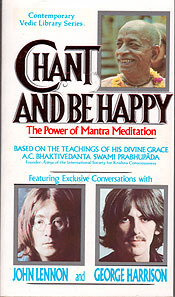 The Toronto Hare Krishna Book Club continues with a new book for April - "Chant and be Happy". For years, the Western world has constantly meditated on the spiritual practices of the East. Many have followed religions and adopted new methodologies for gaining spiritual insights. However, there is nothing higher than chanting and meditating on the Hare Krishna maha mantra. Doubt it? Test it for yourself by reading this wonderful book called "Chant and be Happy"! This small pocket edition answers a lot of spiritual questions and may entice you to indeed, chant and be happy. It includes fifty exclusive pages of conversations with the renowned members of The Beatles, George Harrison and John Lennon, and their experiences with chanting. Join us in reading only 4 pages a day to learn more about the science, benefits, techniques and much more on mantra meditation. To receive daily quotes and realizations, please email us at toronto.sankirtan@gmail.com .